Raising Jack With Celiac : Raising Jack Presents: Pamela's Christmas GIVEAWAY! Raising Jack Presents: Pamela's Christmas GIVEAWAY! It's the season of giving and it's time for a GIVEAWAY! Thank you to Raising Jack's awesome sponsor Pamela's! Have you tried Pamela's Sugar Cookie Mix or Vanilla Frosting Mix? Well, if you have, you know how awesomely delicious they are. And if not, here's your chance to try them! I made Pamela's Sugar Cookie Mix in preparation for Valentine's Day - it was so easy, so fun and so yummy! I enjoyed the cookies so much, that I want you to have a chance to enjoy them as well! ENTER BELOW for your chance to WIN the lovely prize pack above! Giveaway ends by midnight, on Monday, December 16th. Winners will be contacted by email on Tuesday, December 17th. Winners will be posted here as well. (first name, last name initial). Prize packs will be mailed to winners via Pamela's Products. CONGRATULATIONS TO VANESSA C. and MICHELLE K.
Don't worry, I promise to have more Pamela's giveaways in 2014! I love making my grandma's chocolate pie. I had to modify it to be gluten-free, but it is just as good and tastes like the holidays to me. I love Pamela's! Thanks for the giveaway! My 5 year old is gluten free. Love their sugar cookies. Made some for a party over the summer the boys (+40) loved that I added sprinkles. Super easy decorating, very happy "boys". my daughter would love to make cookies for her aunt layne!!! Sugar Cookies, my nieces decorate them for me! I made lots of treats this Christmas, but my favorite is probably the snickerdoodles. I love making peanut butter cookies with Hershey kisses stuck in the middle for my celiac baby girl every year on Christmas eve. I love making chocolate chip cookies. I am thinking that I may make some over the weekend! My favorite gluten free holiday dessert is a chocolate tart (it is dairy free, too) from Cybele Pascal's baking cookbook. We make sugar cookies that we decorate for Santa. Be nice to use Pamela's mix to save time! I like chocolate chip cookies that are the Betty Crocker gf ones I buy for my daughter who has celiac and I really don't taste much difference in them. GF brownies are a favorite at our house! Pamela's dark chocolate cakes with pamelas frosting. Everyone devours it!!! 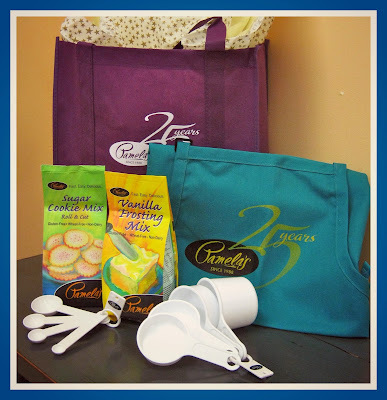 I would adore this prize package; I love to make pecan pie! We love Pamela's pancake mix! Haven't tried the sugar cookie mix yet, but hope to! I love to make quick breads. Pumpkin Chocolate Cheesecake w/gf graham cracker crust! I made a pumpkin applesauce cake recently that was awesome. I could definitely use some free Pamela's. My 37 year old son also has Celiacs. He was diagnosed only a few years ago. I feel very deeply that it was a problem his entire life. Our doctor didn't even give Celiacs a thought, even with all of the symptoms he experienced from the time he was born. Gluten Free Rum Balls ... with a twist of ginger cookies as the base. Would be such a blessing to win this! I LOVE Pamela's products! I've only tried Pamela's Baking Mix and it's wonderful. I'd love to win the cookie and frosting mixes to try them. I have such a sweet tooth, and finding good gluten-free cookies isn't easy!! Caramel Pie with gluten free crust!!! I love GF chocolate chip and sugar cookies! I love making either crustless pumpkin pie or gf chocolate chip cookies for the holidays.